Saturday (1/10) the fourth GAS-festival started. The festival has taken place in Gothenburg every second year since its beginning in 1999 and takes place in several venues in Gothenburg. The program has so far offered everything from contemporary art music to experimental constellations. This year’s version of the festival offers, among others, the music collective Spire, which is connected to British Touch. A collective which includes celebrities such as Philip Jeck, BJ Nilsen and Fennesz. It is a project where classical organ music is mixed with electronica. Philip Jeck opened the evening in the beautiful Masthugg church. He also participated in the latest recording that Spire did in the Geneva cathedral, which has been released as a double cd by Touch. So the genius he shows under this concert should hardly come as a surprise. But the power of Philip Jeck’s concert is still completely surprising. Straight into the hard and ecstatic energy currents. Whether the music is feather-light or violent, he keeps us in his grip throughout the forty-five minutes. The silence following Philip Jeck’s performance is met by the the audience applauding. And then the prominent British organists Charles Matthews and Marcus Davidson perform JS Bach, Rune Lindblad, Franz Lizst and Sven-Eric Johanson. They both have the technical brilliance and approach the music in an unbelievably beautiful way. 9:45 BJ Nilsen, one of the most central and influential artists in sound art, enters the stage. After 45 minutes of electronic minimalism, we get a little break where Leif Elggren and Henrik Rylander create a variety of sound, before Charles Matthews plays his next piece. Just before midnight, the evening comes full circle with Vienna resident Christian Fennesz. Using a computer he creates mind-blowingly beautiful worlds of sound. His music is of indescribable intensity and beauty. This is easily one of the best evenings I will remember from 2005. When the record artist Philip Jeck’s pulsating and multilayered contemporary electronica, full of demonic samples is blended into one of Bach’s passacaglia for organ, an overwhelming space is created. An experience that transfers the beautiful Masthugg church, situated on the top of Mount Masthugg, even closer to heaven. Or someplace nameless. It is the most powerful experience the GAS festival has produced in its four-year history. 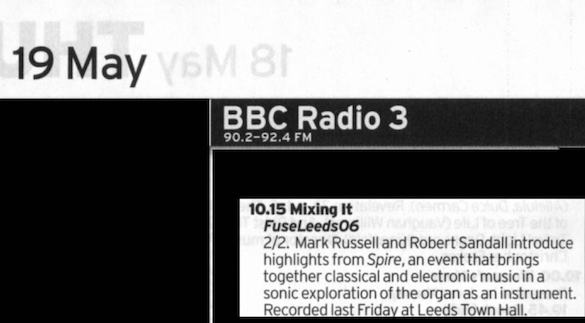 “Spire Live” is a project where the electronica artists Philip Jeck, Fennesz and BJ Nilsen together with the organists Charles Matthews and Marcus Davidson travel around Europe and set sound in churches and cathedrals in a new way. In Gothenburg, that meant four hours with everything from medieval and Bach to Arvo Part and the city’s modernists such as Rune Lindblad and Sven-Eric Johanson. Musikradion’s channel 2 broadcast the first half of the concert direct Tuesday night – but promises to continue with the rest. Don’t miss it! This year’s GAS festival has presented contemporary music from Lithuania and Poland. But the best has been the transference and displacement, in time as well as in space. Built from the 12th century, the Roman and Gothic building has a specific place in Geneva. During the 16th century, the protestant reformist Jean Calvin transformed the cathedral into a stronghold, and it’s from here that his political and religious vision, known for its imposing austerity, spread progressively. His faith was going to have an important impact on Geneva’s identity, which is still noticeable, even today in various aspects. It’s particularly visible in the architecture of the Old Town, of which the cathedral constitutes the center. 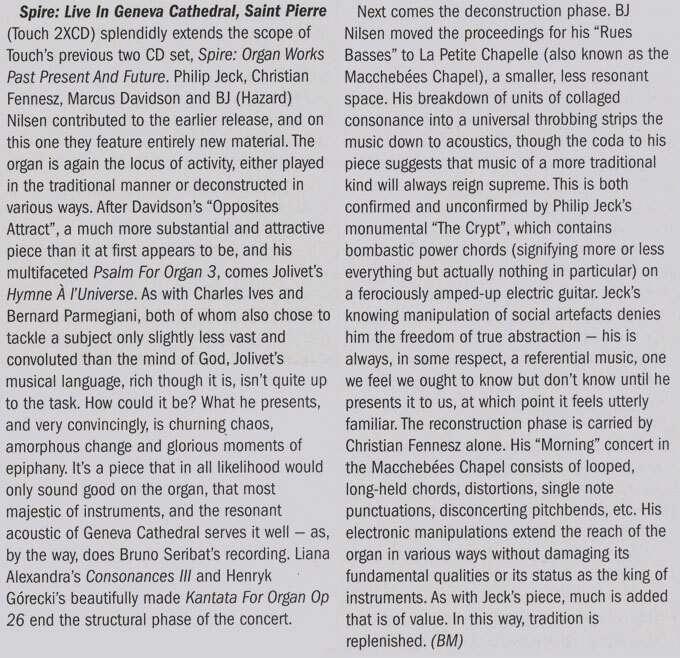 On the 5th of September 2004, a concert, based on the Spire : organ works past present & future concept (Touch Tone #20), took place in the cathedral. The event seemed provoking and iconoclastic in contrast to the severe and austere atmosphere of the cathedral. Though some of the musical pieces were audacious, the music focused mainly on spirituality. It generated a different perception of the organ pieces, thus modifying our perception of the cathedral and making the event truly exceptional. What does it mean to embrace a place musically? It is trivial to state that sound is an integrated part of space, and vice versa. This idea has already been analyzed at length. Though, to investigate space and an instrument such as the organ, in a different way, by structuring and deconstructing it, in order to restructure it, seems to me an original approach. The organ is the central instrument, the electronic instrument becomes then its respectful successor. But one should be careful: successor does not mean replacement. During the concert, the electronic instrument worked at breaking the organ sound in order to inject a new life into it, and was further influenced by the transcendental and elevated dimension of the space. This new dimension was complementary but not exclusive. Some of the cathedral spaces were used for this purpose: the cathedral itself, with its huge organ, the Small Chapel and the Chapel of the Macchabées, with its archeological underground site, where various objects evoke Geneva’s antiquity and the cathedral’s history. The initial phase offered pieces from contemporary composers such as the British, Marcus Davidson, the French, André Jolivet, the Romanian, Liana Alexandra, and the Russian, Henryk Gorécki. This section demonstrated why organ is considered the King of Instruments, its solemnity was underlined, with its power and its wide range of sonorities. The cathedral’s acoustics being particularly remarkable, the strength of the instrument appeared in its fullness. Marcus Davidson – Opposites Attract: The piece is a great starting point, as it is majestic, alternating grave and mellow moments. It welcomed the audience. 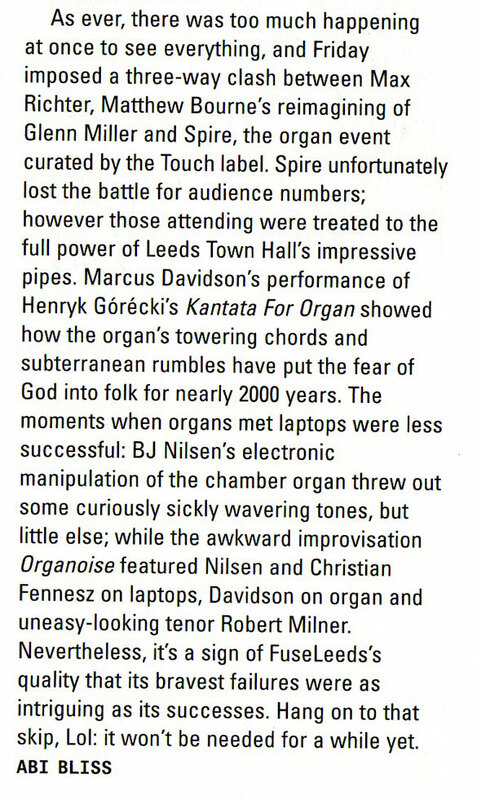 Marcus Davidson – Psalm for Organ 3: A transitional piece, short and intimate. André Jolivet – Hymne à l’Univers: As indicated by the title, it is a homage to the universe. The celebration of the stars, the galaxies, the suns and the planets is created through interrogative sentences, some quite brutal, reflecting the variety of the planets before ending in an apotheosis, in order to demonstrate the infinity of outer space and the mysteries which inhabit it. Liana Alexandra – Consonances III: It is probably the most minimalist piece of the concert. It is based on repetitive sequences, creating a soothing feeling for the listener, much like a lullaby. Henryk Gorécki – Cantata for organ, Op. 26: A very solemn, not to mention martial piece, the cantata opens with gigantic first chords, wide, and then progresses to uncover the organ’s sound which develops with power, particularly in the bass. The king of instruments reigns, the public owes it respect: after all, we are in its church, in its temple, in its palace! This second phase was hosted in two different spaces. First, the Small Chapel next to the cathedral, also named the Macchabées Chapel, of which the foundations date from the 14th century. Originally a funeral chapel, the Macchabées Chapel offers an intimacy in contrast to the cathedral’s high stained glass windows belonging to the Neo-Gothic tradition. The deconstruction phase continued in a second space, the archeological site. Situated underneath the cathedral and the Macchabées chapel, it is used to exhibit various archeological objects belonging to an important cultural Christian settlement dating back from the 4th century. BJNilsen – Live in the Small Chapel: This piece was played in the Macchabées chapel, next to the cathedral. In a duet with himself, BJNilsen moved back and forth between organ and electronic. He established a link between the old sound inherited from centuries past and a new one being instantly generated. The organ sounds were coming out of the pipes while the new ones were created with the help of micro-processors. They gathered to be assembled in the intimacy of the chapel space. The organ sound was decomposed and in a way, tortured, in order to get at the core of the sound. At this point, the choice of language had shifted. The organ’s sound was used by BJNilsen as source material from which he created some samples. But BJNilsen remained very respectful towards the King of Instruments. The samples appeared often in the company of single notes played on the organ as if to remind the listeners of its eternal existence as a proper instrument. BJNilsen’s piece ended with a background organ sound, as if to remind us that after all, even if altered, the organ had remained the core theme of the entire concert. Philip Jeck – Live in the crypt: Played in the archeological site, underneath the cathedral, the piece could be seen as part of some sonic archeology. Starting with organ sounds, rock sources, kitsch and various scratches, Philip Jeck allowed us to go back to the origin of sound, back to the raw material, which may also be defined as sound. With a certain irony, the musician moved to the perennial vinyl record, using it as both source and surface. Is it a coincidence of some sort… Could we consider vinyl as the king of sound recording material? Is vinyl undermining the promise of eternity of digital documents, mp3 and others? Anyway, we were offered an impressive turntablism moment. Facing a mosaic dating from Antiquity, in an exiguous space for the numerous listeners, the audience became aware of the meaning of Time. Not simply the passage of time, more so, the creative process of an art piece made time meaningful. It was not coincidental that the concert was delivered underground: revisiting the History of sound, the History of recording through the vinyl material, the public was also taken back in History by the cathedral and the archeological site. It was then difficult to resist questioning our metaphysical origin, our connection with History, with Eternity, with music and with creation. For this last phase we were invited to return to the Macchabées Chapel. We needed some intimacy after being subjected to such sonic work. Our spirits were packed with rough sonic matter, deconstructed sounds, the solid ground had shifted under us. We needed some serenity after being faced with numerous questions: what is our relation to creation, to sound, to noise, to music, to organ? Christian Fennesz – Live in the small Chapel: Christian Fennesz delivered a single piece that seemed to answer all these questions. He worked at reassembling organ and electronic sounds, aimed at shaping the former into a new configuration. We felt a sense of elevation, as he added various sounds, complementary notes and some new sounds which evoked the organ. The elevation established a transcendental link between audience and the music, which was enhanced by the height of the chapel and its stained glass windows. The apotheoses came slowly, as we closed our eyes and bathed within this sonic environment, further enriched by the religious atmosphere. We then became part of a true sonic ocean, an organic one, giving birth to a new form of sound and music, freed from the notion of Time, simply named Life. And Beauty. The history of the King of Instruments will not cease with the end of the concert. The audience hesitated to come out of the cathedral, as if not wishing to leave behind the sounds that they had be part of for three hours. Then, on the cathedral forecourt, everyone talked of the King of Instruments. From now on, all those who return to the St Peter’s Cathedral, will see it in a very different way.